There’s no way Trey alone could generate the kind of buzz that these shows have garnered, nor will the crowd be all Phish phans. Consider that Phish has not sold out every show on their recent NYE, fall, and summer tours, only select ones. Consider that even in NYC, which is probably Phish’s biggest market based on east coast location, there were only between 15,000-20,000 people at each of the Randall’s Island shows last summer. And consider that when Phish threw a festival on July 4th weekend in 2011, the same weekend as these Dead shows this summer, they only got about 35,000 to come to an easily accessible venue in Watkins Glen. On the surface, sure, it would seem that maybe the Dead felt they needed someone with the “star” power of Trey to fill a venue like Solider Field. Let’s just say hypothetically that everyone who went to SuperBall (35,000) would go to all three of these shows – that’s basically half of the 70,000 that Soldier Field holds. Again, this is the most people that Phish have been able to attract to any of their shows since they returned in 2009. But SuperBall (and it’s more or less equally attended predecessor Festival 8) were camping festivals featuring eight sets of Phish. This is just Trey. And as it’s becoming increasingly clear, not all Phish fans are Deadheads. In fact, many phans, especially those who’ve come on board during the 3.0 era, don’t really care about the Dead. While I don’t pretend to imagine how many of that potential 35k this excludes, let’s just say for argument’s sake 5,000. Those festivals cost about $200 for a camping and music pass. Most people drove given its east coast location. Average the cost for 2 people of gas and tolls (maybe $100? ), 2 tickets, and food, and you’re looking at a nice little July 4th weekend around $600 for a couple. For Chicago, however, many will be flying in and staying at hotels. For 2 people, let’s assume a $200 round-trip ticket, a $150 a night hotel room if you booked before the announcement ($500 total after taxes), food, drink and recreational activities in a major city around $200 per person for the weekend (less if you’re being frugal, but potentially more if you wanna eat at a nice place in one of the best restaurant cities in the world). That’s already $1300 for two people BEFORE tickets! And if you got the cheapest seats available, that’s $70 per person after fees ($420 for two for all three shows). In other words, Chicago will be waaaaayyyyyy more expensive than one of the festivals. Let’s say that eliminates half the remaining interest. So now we have about 15,000 Phishheads. But there’s also the fact that plenty of Phishheads who are also Deadheads just plain don’t want to go to this. I’ve seen this online quite a bit – people who love both bands but don’t feel the need to hear this for a number of reasons. Let’s say that knocks another 1,000 phans out. Obviously I’m just making up these numbers, any of them could be completely off (so don’t feel the need to suggest that I’m wrong!) and the reality could be totally different. The pull of nostalgia might convince people to ignore these issues and just go, and it’s certainly possible that there are more phans than went to SuperBall who are interested in Chicago. But as I think I’ve shown, that’s a highly problematic assumption. There are so many factors that, based on my own sense of the phanbase pulse, are probably going to keep Phishheads away. So who are the 300,000 people who wanted the meager 10% of the total tickets available through mail order? My guess is that people have come out of the woodwork. 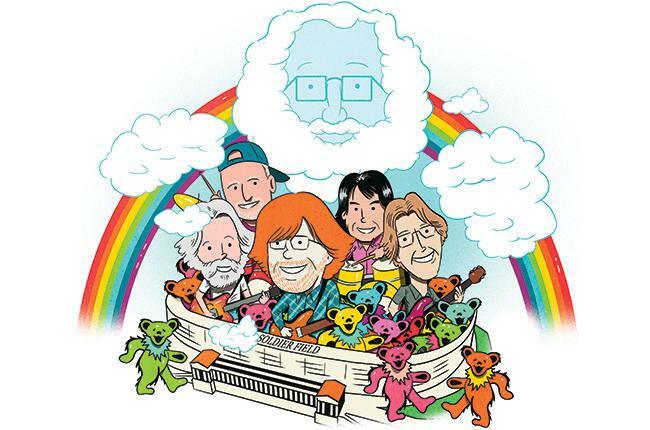 Spurred by the pressure of not missing “the last” performance of the core four, Deadheads who didn’t necessarily go to the Dead’s shows in 2004-2009 are willing to throw down a lot of money and effort to make this happen. These are fans who didn’t really care about Furthur, don’t really go for DSO, but are suddenly awash with the realization that this is the last time to see the Grateful Dead. And that’s the thing that I think is the biggest issue, and that the author of the aforementioned article actually did get right: this is NOT the Grateful Dead, and the use of that name is the reason these shows have gotten overblown with attention and demand. Bob Weir himself said that he didn’t think they would be billing this band as the Grateful Dead, but in fact that is the name on the ticket, and that’s what scalpers, authors of articles on both major media and clickbait-y websites, and Chicago Bears season ticket holders glommed on to. They don’t know that, although this is being billed as a “reunion,” Phil, Bobby, Mickey, and Bill played together frequently from 2002-2004 and again in 2008-2009, and most of those as “The Dead.” They don’t care that Bob and Phil have been touring together for the past 5 years as Furthur, a band with no other original members but arguably musically better. They don’t know that the last time the core four played together, reviews were mixed. All they know is that a band that hasn’t appeared on a venue marquee in 20 years is reunited for the last show. And that means a pay day. And it’s this that has driven the rampant speculation and absurd ticket gouging that is currently happening. Not the inclusion of Trey Anastasio and maybe the extra 10,000 Phishheads he’s bringing to this party. As I’ve said on social media already, please please please do not purchase tickets off StubHub. And if you are lucky enough to have tickets and can’t go, please do not sell your tickets above face value or sell them to someone who isn’t planning to go. As the dates get closer, people will drop out and face value tickets will become available. I’m sure of this, although nowhere near as many as people who want to go. And the scalpers will be forced to lower their prices. This sounds like a pipe dream but it can, and does, happen. Most importantly, I hope that all the negativity that’s out there now will blow over so that those who are there in attendance in Chicago will be able to have a good time celebrating the music they love with people they love. ~ by Jake on March 8, 2015.